The weekend of 5 March began "Clean For The Queen" events around the country, and the Friends of Three Cornered Copse used this motivation to clean the litter from the largest woodland in Hove, after a long winter of use. 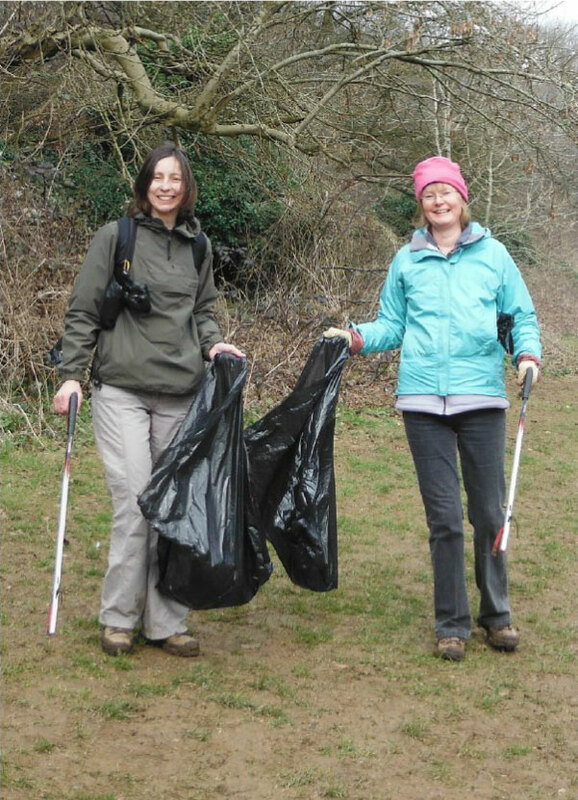 The weather was cold and grey, but dry, when 12 volunteers and one dog spent the morning wandering the copse with council-supplied "litter picker" tools and a box of black plastic sacks. Some 25 black bags were filled in that time, as we spread around the area and tackled the litter dropped over the past few months. There were the usual crisp packets and sweet wrappers, we found numerous full black "poo-bags" (surely there's just one person who does this? ), bottles, cans, cardboard coffee cups, one car hub-cap and three un-opened bottles of Pinot Grigio. Apart from this, the popular drink of choice in the copse seems to be canned cider. The Park Ranger was on hand to pick up our collection at the end of the morning. Some encouraging news received about our Ranger service, who have escaped some of the severe cuts the council are having to implement. Most of the Ranger team will remain, losing 1.5 heads from the team, rendering them still functional but under-staffed. Well done to all those who lobbied councillors and council meetings recently. A whiff of spring is in the air as the winter subsides. The official spring start was 1 March which arrived like a lamb, (so will go out like a lion?). Anyway, the cow parsley is sprouting already on the woodland floor and the clumps of snowdrops (planted by the Friends of 3cc in previous seasons) are standing proud around the muddied paths. The daffodils too, which emerged in December, are still decorating the lawn fringes in the top field. Some of these areas have been rather inaccessible as the mud lingers but thankfully the firmer areas are passable for walking and cycling once again. Our thanks goes to all those who took part in the Clean for the Queen event, it really looked like a difference was made at the end and a sanctimonious glow kept us warm as we worked. As we left the copse that afternoon, the skies darkened and the rain came back - we were spared once again from the bad weather.